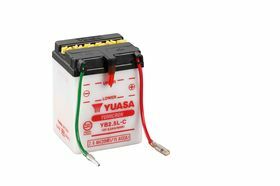 The Yuasa YuMicron Motorcycle 12V 2.5Ah Battery YB2.5L-C (DC). Mostly suitable for Yamaha, Honda, Bajaj and many more. Please see Motorbike Fitment tab for the full list. Yuasa YuMicron Motorcycle 12V 2.5Ah Battery YB2.5L-C (DC) is packed with technology for the highest reliability and cranking amps. Yuasa is leading brand in motorcycle battery industry. So if it's for off road jet skiing lawn mowing or conventional use the robust technology, precisely tuned to the specific loads of motorcycles, provides a long life and reliable starting power 12V batteries.